First, some of your terms are a bit off. 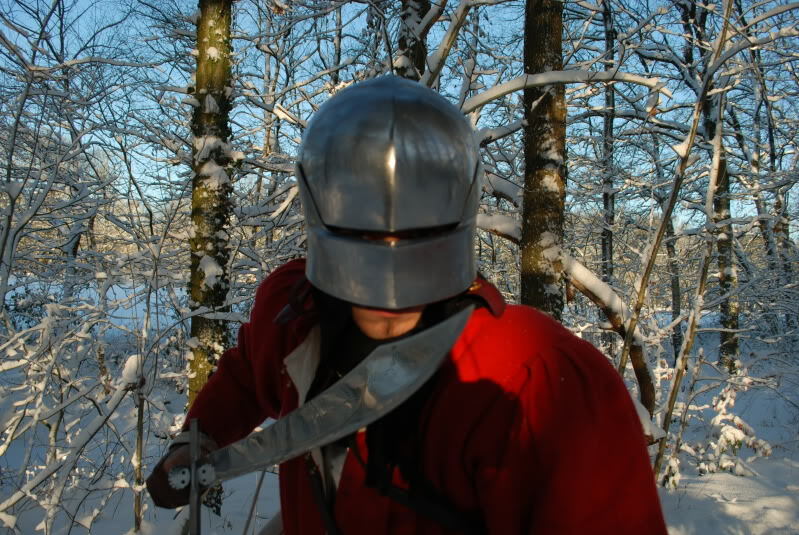 A man at arms is a fully-armored combatant in full harness with a complete set of weapons, horses, etc. The term is a collective one for all such men, from barons and lords down to wealthy gentlemen who could afford to armor themselves but who were not knights. 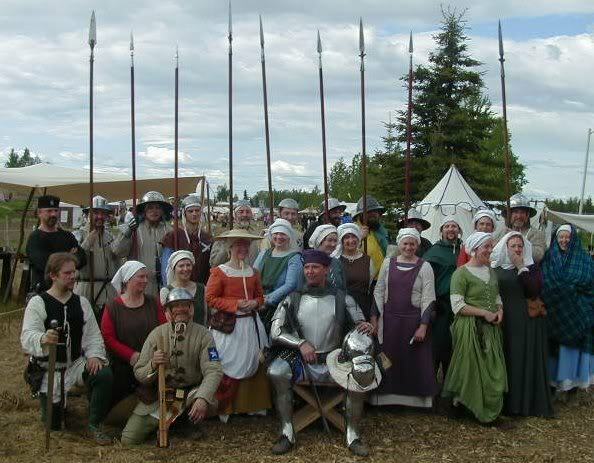 The movies give people a sense that there was this ragged-looking, partially-armed group of rough and ready soldiers, not those "effete" knights, who did the real fighting in their dirty, ragged munitions gear, but through most of the middle ages from the 11th through the 15th century, that wasn't the case. 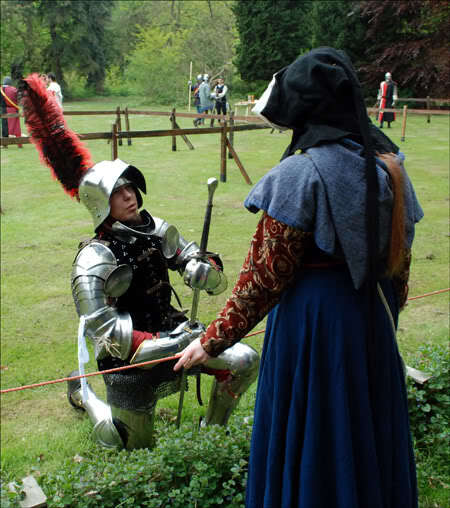 About the closest to that you would get prior to the very late 15th century were English billmen of the Wars of the Roses, and some of them seem to have almost as complete of a harness as a man at arms. Second, for many of the big battles in medieval Europe, many of the foot soldiers on the front line were men at arms--knights, if you will. 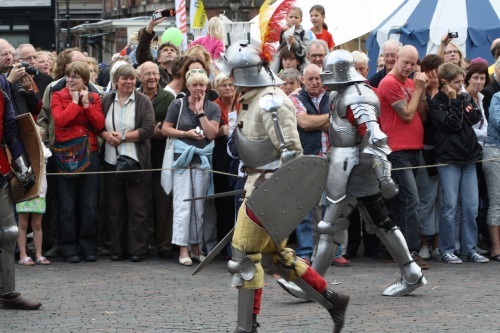 In many cultures, particularly the English and French, dismounted knights were the norm for the fourteenth and fifteenth centuries. Of course, mounted men at arms were used as well, but usually in much smaller numbers. 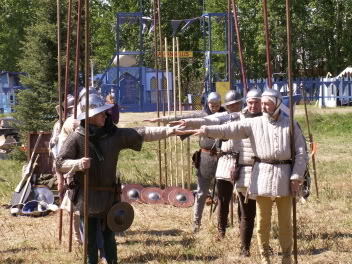 Almost all of the knights at Crecy, Poitiers and Agincourt, for example, fought afoot, and many of the actual front-line troops (i.e., not archers) were either knights or squires; there were almost no billmen or spearmen (both the English and the French brought non-knightly "spearmen" to battles, but in most cases they were really laborers). 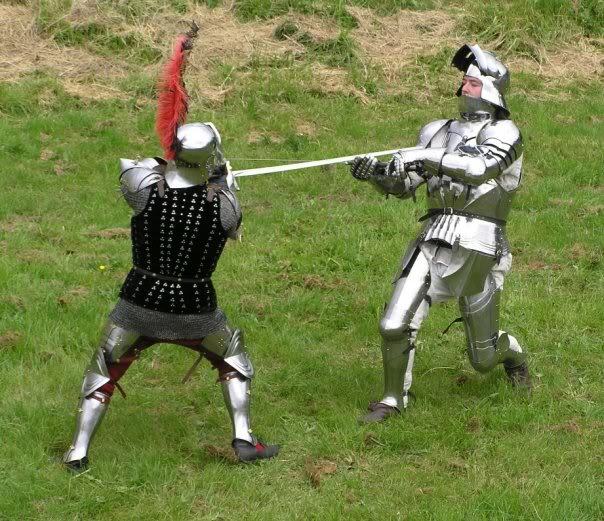 Of course, there were lots of other non-knightly troops on the medieval battlefield, from gunners to bowmen to billmen, but most of them--except the billmen--were not front-line troops. Then there were the city folks of Flanders, for example, who dealt the French such painful defeats at the beginning of the 14th century. 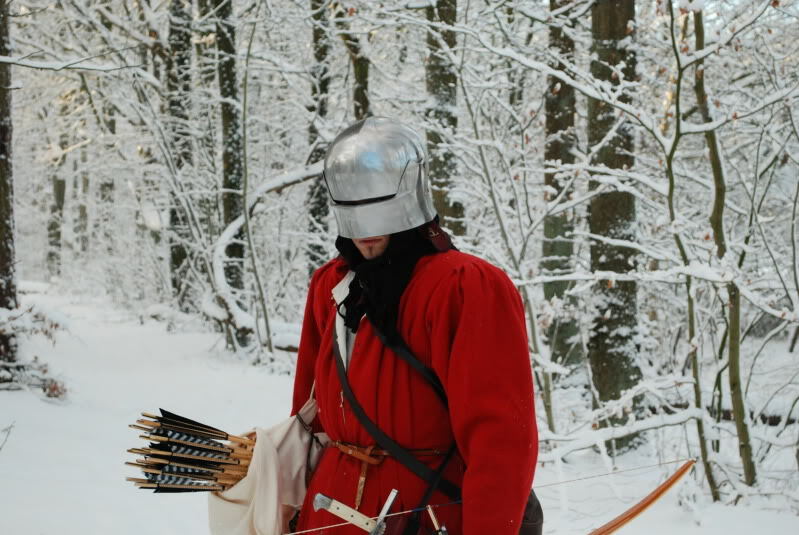 They had kits ranging from men at arms to poor men with some kind of helmet and a simple weapon. ooh, now that i read my own post, it does seem that i misspoke. (i dont think ill be posting under the effects of caffeine anymore). no, know what a man-at-arms meant, what i am referring to would be a kit of someone representing one who is serving on foot. there has to be some differences, i bet they weren't carrying their lances out there for foot combat! sorry causing confusion in my terminology. Sometimes they were, but they cut them shorter. We have a chronicle that says the French cut their lances down to five feet in length when they marched up to meet the English knights at Agincourt. 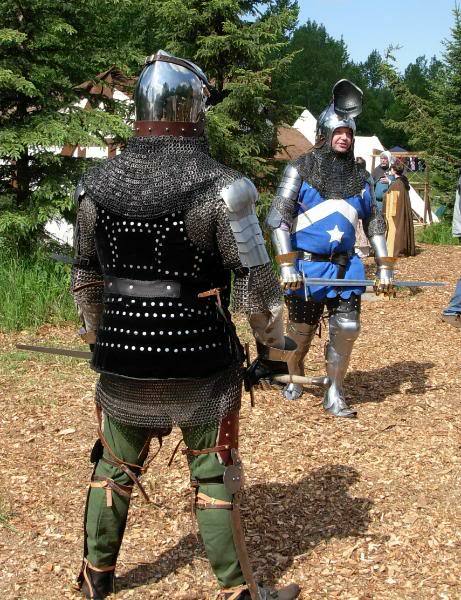 There were relatively few differences in the harnesses worn until well into the fifteenth century. The first piece made that was different for horse combat vs. foot was the manifer, and that was mostly used for jousting, not for warfare. And I've read that they sometimes took their sabatons off for foot combat. Here's a few from about a 12 year time span with my history group. as you can see, I wear lots of padding with Jackchains and some plates. I wanted that my kit looks like it was taken from people who died at a battle. This is planned as an mid 14th cent militia (some changes needed, as other gauntlets), then it will be supplemented by coat of plates, elbow cops, soup can knees with splinted cuisses, but you can get the idea already. On the issue of mid to late medieval army composition, it depends on the time frame and region. Let me do a very condensed break down of England and Scotland. Both countries had a system in place (England from the time of the Saxons Fyd and Scotland from the time of Robert the Bruce). 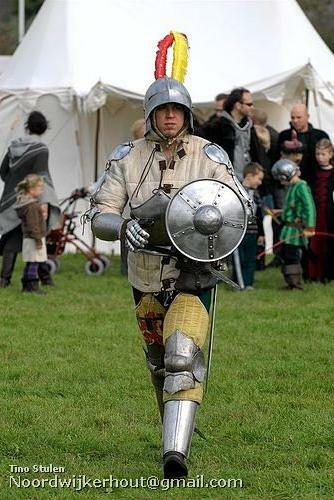 Each country in the 13th & 14th century had Men at Arms :Knights, unknighted nobles, and trusted commoners that had a income that allow the owning of armour. The bulk of both armies would come from the free men and tenants of the nobles. 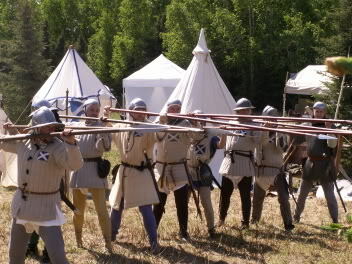 The 15th century saw major changes in the composition of the late medieval army in most counties. Each county had a law that spelled out what items of war each male of war age was to own that was updated and reinforced by each Crown. 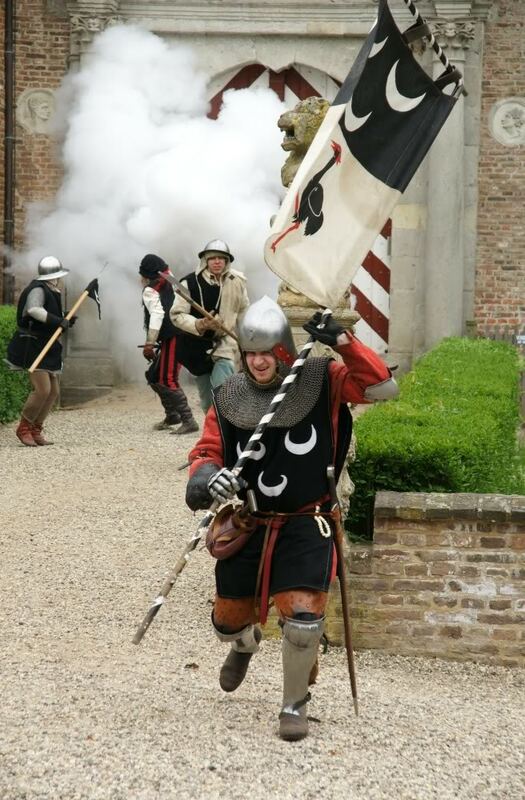 While Scotland had a reputation of being equipped with older arms and armour (that would be the Highland Scots and the Men of the Isles) the Men at Arms in the Lowlands were allies of the French and had a brisk import trade going with the German City states, the Italian City states, the Low Counties, France and Spain. 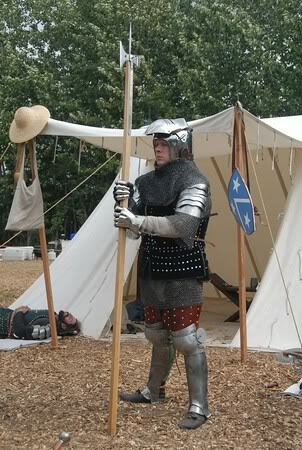 So the Knights and wealthier unknighted nobles, and commoners could have some very nice armour (or older well kept armour that met the law) The base tenant farmer in the lowlands was expected to own a 14 foot pike, padded coat, dagger, maille covered gloves and a iron cap. 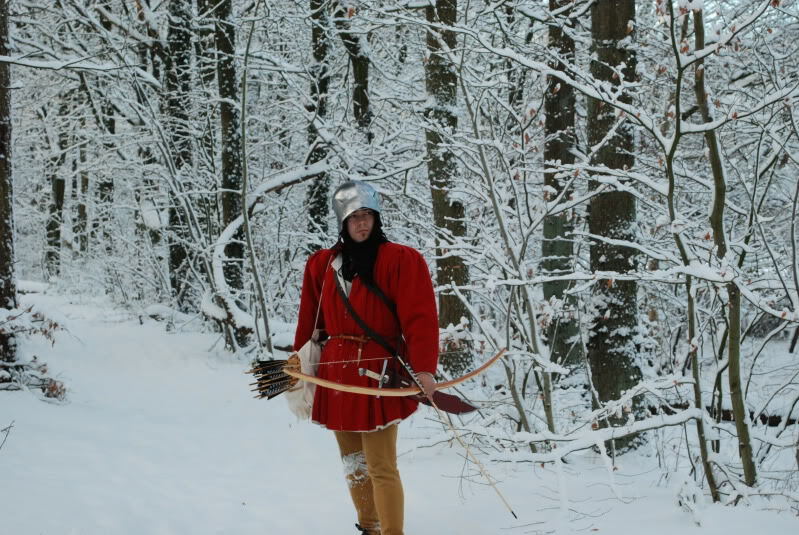 On the English side of things, the archer was the basic soldier of the army with the Men at Arms being the heavy infantry. 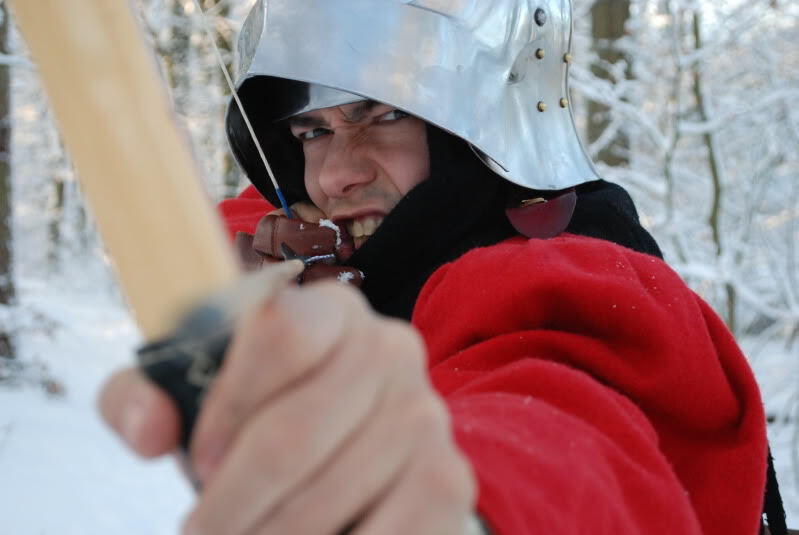 (It's not until the later 15th century that the English Billman get listed in the payrolls) Both countries had adopted the battlefield tactic of the Men at Arms fighting dismounted . 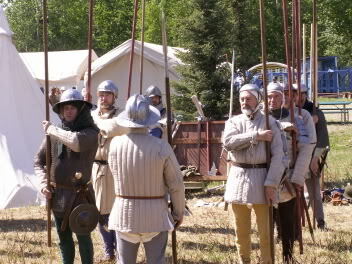 (Unlike the French who held on to the mounted charge) The Scottish Knights and the other Men at Arms fought to protect their pikemen within the pike formation (They weren't some unknown serf, they were the knight's own tenants and the non noble Men at Arms lived among them. They knew each other by name). 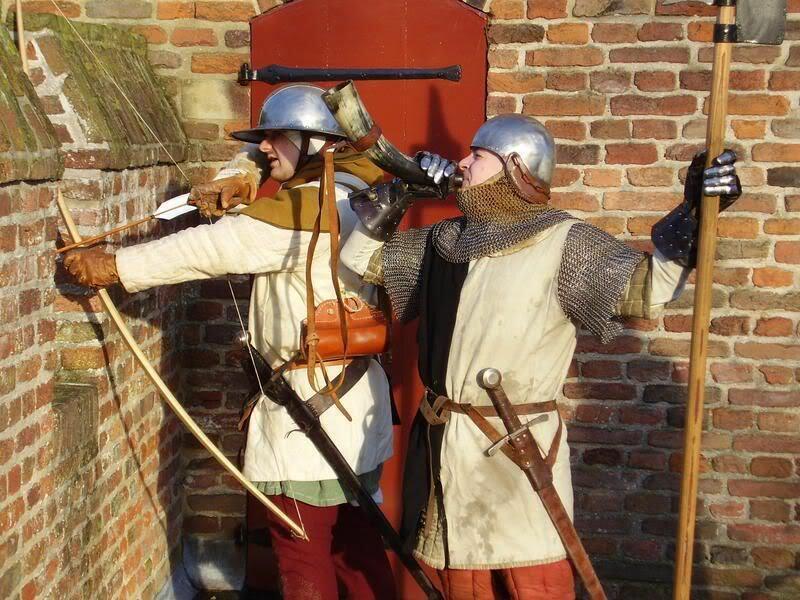 You see the same thing on the English side of the border with the lesser knights, non noble Men at Arms and lesser nobles, but the battlefield tactics differed with the use of English archers instead of the Scottish pike and schiltron formation. Each country had a set number of days a person could be called up to serve per year (around 30-45). Unless a portion of a country was attacked, most men were not called up to fight. They picked the best out of each holding to go to war and left the rest behind to continue with the farming and trades that each noble's holdings had to do to keep the local noble solvent and the tenants fed. 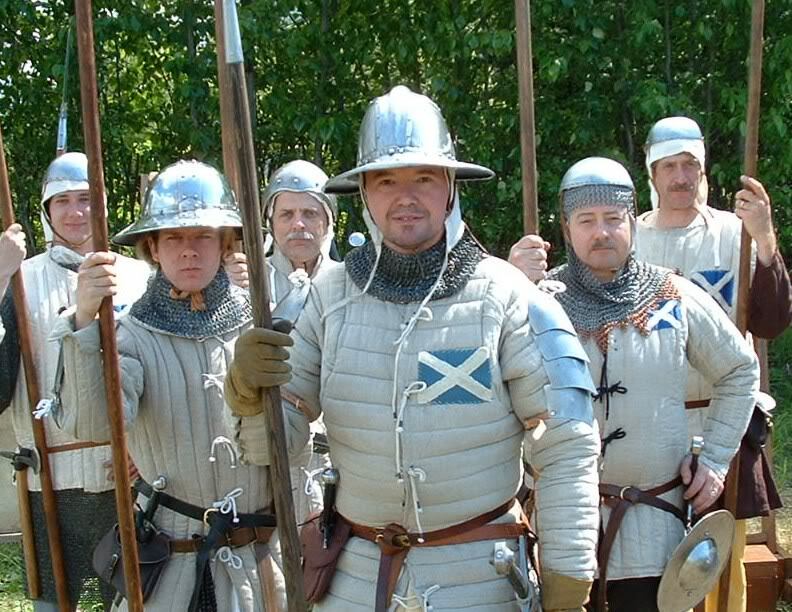 The English paid their troops when called up per the law, the Scots did not (but allowed them spoils of war). The 15th century saw the earlier system of feudal armies become too unwieldy and expensive to maintain so you see the rise of the professional soldier and the so called free companies supported by a tax base and spoils of war . 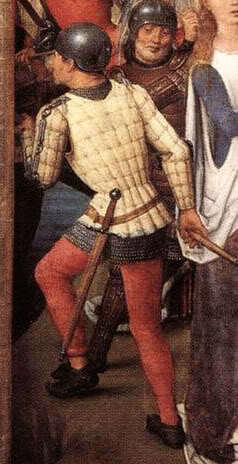 Now, a base foot soldier of the 15th century can be lightly armed with a jack (extra points for filled caped sleeves) jack chains ( on a non-filled caped sleeves) a open face sallet , gantlets and either no neck protection, a maile standard, or a bevor. 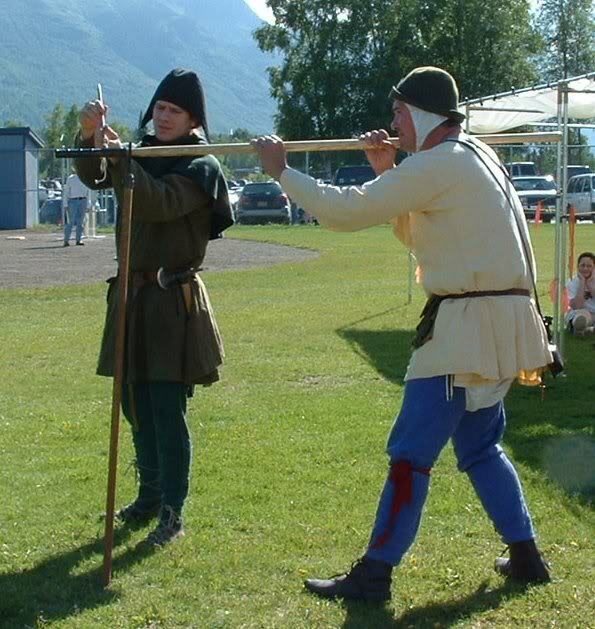 Add a primary weapon ( spear, poleaxe, crossbow, arquebus, et al) and a back up weapon (longsword, arming sword, falchion, messer, and a buckler) and the ubiquitous dagger and you're set. 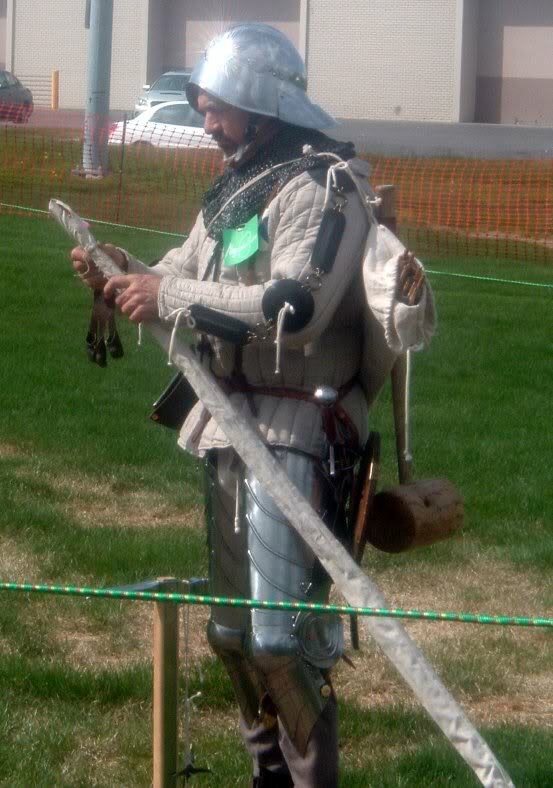 You really don't have to have a maille shirt (under the jack in the 15th century btw), archers knees, jack chains, brigandine, breastplate, backplate ,pauldrons, arms, or a 3/4 to full harness for the basic look. 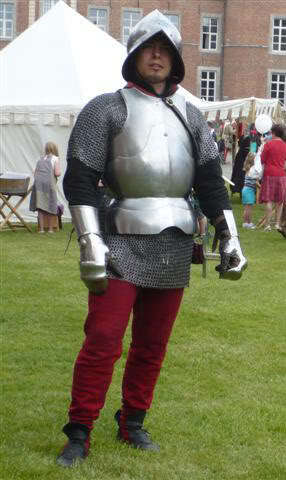 You can start with the proper clothes, jack, helm, gantlets, dagger, and a primary weapon for a good basic look, cheap. 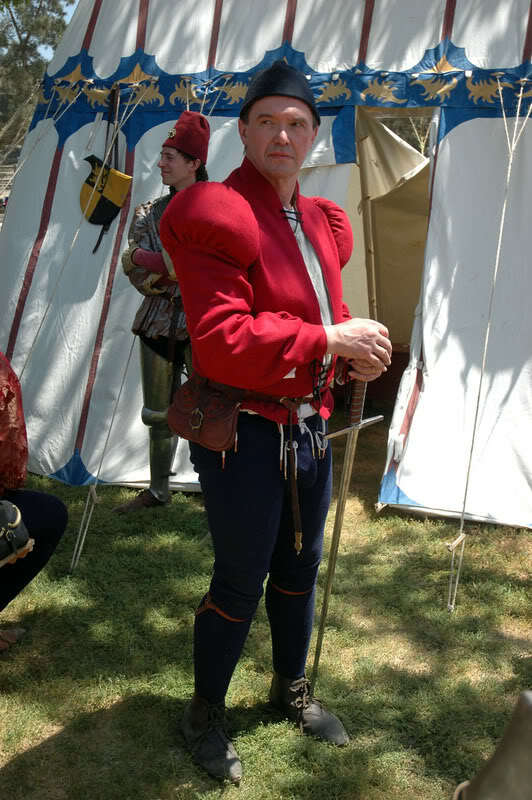 My 15th century look sans the arms and armour. 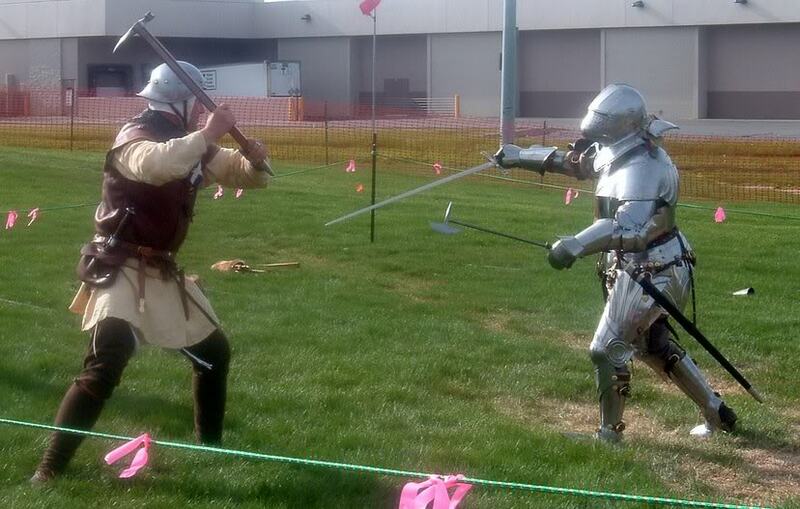 My former 14th century man_at-arms kit (right) and an good friend of mine. 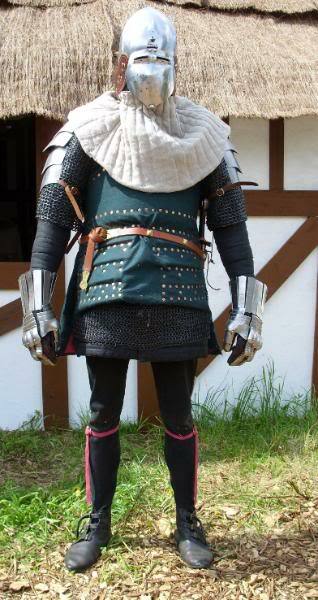 My current kit of a lower nobleman. For contrast. Alex, a top-notch kit and AMAZING photography. How in the world did you guys get clearance for an EXPLOSION? Ben - I would really love to meet the person who had the balls to stand directly in front of a man with a drawn bow to take a picture. They must have some serious trust in you. Those longbow photos were all taken by myself, with help of a tripod, the auto shutter and a remote (hidden in my drawhand). Although I must admit it took some balls to draw my bow so close to my Nikon D80... I was getting tired during taking this series (there were lots more, but in total I kept 12 pics) and was very scared of accidentally shooting my lens to bits. I wouldn't have done this with someone behind the camera. Thanks. Maybe the Dutch goverment is more tolerating of such things then yours. I don't know your laws on this. 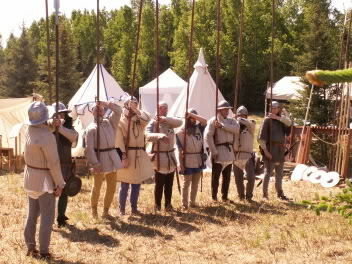 But blackpowder weapons and charges are commonly used for these kinds of demonstrations. http://s85.photobucket.com/albums/k79/Bonsart...gh%202009/ for some more pics of this demo. @Ben Nice pics. See you next time. Haha, clever shooting there Ben. Although I must say, were it me trying to get the same shot, I think I may be more willing to put a person in front of me than a Nikon D80. Just kidding of course. Awesome kit and even more awesome photography!